Buyers flee SUVs and pickups but can't find the cars they want, resulting in steep declines at most automakers. Weak demand for pickups and SUVs in the face of record $4 a gallon gas has caused Ford to delay the rollout of its 2009 F-Series pickup. NEW YORK (CNNMoney.com) -- June auto sales plunged, according to reports from the nation's major automakers, as Americans shunned pickups and SUVs in the face of record gas prices and growing concerns about the weak economy. Despite high gas prices, sales of many fuel efficient car models also fell sharply in the month as automakers were caught without the supply of vehicles that people suddenly wanted to buy. The initial reading of industrywide auto sales from Autodata showed sales tumbled to a seasonally adjusted annual rate of 13.6 million vehicles in the month, down from the 14.3 million pace in May, which was also considered a weak month for sales, and 2 million cars and light trucks below the year-ago pace. It was also the weakest sales pace in 15 years. The unadjusted sales fell 18%, which is the sharpest drop since October 2002, when the decline was due to comparisons with a record sales month, not historically weak demand. It was far worse than the 12% decline forecast by sales tracker Edmunds.com, although somewhat better than estimates of a private forecast from auto industry consultant JD Power & Associates, which had seen sales falling as low as a 12.5 million annual rate. While the shortage of fuel efficient cars on dealer lots hit even the sales of Asian automakers, they were in far better position than the traditional Big Three U.S. automakers to deal with the shift in American's buying preferences. In fact, the Asian brands captured 46.2% of overall sales, edging out the 45.8% of sales that went to the U.S. brands, according to Autodata. The same thing happened in May, marking the only two times that the U.S. brands have fallen behind the Asian brands in U.S. marketshare. European brands made up the rest of sales, placing the Big Three in their weakest competitive position ever compared to their overseas rival. Until last year, there had never been a month that American car buyers preferred the combined offerings of Asian and European automakers to those of the Big Three. At least General Motors (GM, Fortune 500) held onto the title as the nation's No. 1 automaker in terms of sales. GM only narrowly edged Toyota in the May sales report, but even though its sales fell 18% in June, it opened up some distance with its Japanese rival in U.S. sales. 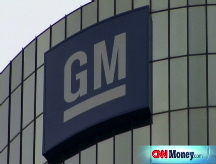 General Motors reported that its U.S. sales fell 18% in June versus a year ago. Sales of GM's light trucks, which includes pickups, SUVs and so-called crossovers, tumbled 16%. But that was better than GM's car sales, which dropped 21% in the month. "We're doing all we can to meet customer demand for our popular crossovers and cars, including increasing overtime or adding Saturday shifts," said Mark LaNeve, vice president at GM. Still, the results were better than forecasts of an overall 25% decline in sales. And it was good enough for GM to hang onto the title of the No. 1 automaker in terms of U.S. sales. Shares of GM finished 2% higher Tuesday on the news. Other big automakers missed forecasts, however. Toyota Motor (TM) reported a 21% drop in U.S. sales in June from a year ago, far worse than the forecast from Edmunds.com of only a 12% drop in sales. It was the biggest year-over-year decline in U.S. sales in 10 years for Toyota. The Japanese automaker, which is No. 2 in U.S. vehicle sales, saw a 15.6% jump in sales of its compact Corolla. But sales of its fuel efficient subcompact Yaris, as well as of the Camry, Toyota's best selling U.S. model going into this month, declined slightly. The Prius, the nation's best-selling gas-electric hybrid, saw its sales fall by a third, due to tight supplies. "This was a missed opportunity for Toyota this month," said Jesse Toprak, chief industry analyst for Edmunds. "We've heard a lot of reports from dealers they could have sold twice as many Priuses, if not more, if they had them in inventory." But it wasn't just a problem for Toyota, said Toprak. None of the automakers had anticipated the sudden rise in gas prices or the sudden demand for fuel efficient vehicles. "Even the most capable are not set up to respond to market place changes this quickly," he said. "It'll take from a few months to a few years to fully respond to the change in demand." Ford Motor (F, Fortune 500), the No. 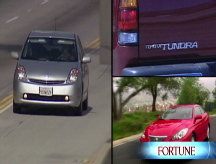 3 automaker in terms of U.S. sales, posted a 28% decline in sales -- steeper than Edmunds.com's forecasts of a 25% drop. Ford saw demand for its SUVs plunge by more than half and for pickups and other trucks fall more than a third. Even crossovers, a sign of strength in the light truck segment until recently, saw sales off 18% from a year earlier, as buyers went searching for more fuel efficient vehicles in the face of record $4 gas prices. Weak demand or not enough supply? But Ford also didn't have the cars buyers were looking for, as its car sales fell 12%. "That limited supply we believed had an impact," said George Pipas, the director of sales analysis for Ford. Bob Schnorbus, chief economist for J.D. Power & Associates, said the sudden shift in demand for smaller, fuel-efficient vehicles came at the worst possible time for the industry. That's because automakers were not able to quickly ramp up production of the cars now in hot demand due to scheduled plant shutdowns to gear up for production of next year's models. Ford has announced plans to cut back production of its light trucks and an increase in production of cars. But it hasn't been able to respond to the sudden increase in demand for cars. "Clearly, the rapid rise in gasoline prices, and the resulting shift toward fuel efficient vehicles, has been challenging," said Jim Farley, Ford group vice president, in a statement. Making matters worse, Schnorbus said rising gas prices and the overall sluggish economy are making consumers reluctant to hit dealerships. "Anywhere you want to look, credit conditions, the job market, stock market, you can see the consumers are getting hammered," Schnorbus said. "If there was ever a time when you want to sit back and wait out the storm, now is the time to do it." Toprak added that many people with gas-guzzling SUVs or pickups are finding some dealers unwilling to take those vehicles in a trade because of declining resale value. "We've never seen that before," he said. Honda Motor (HMC) bucked the industry trend, as its U.S. sales edged up 1.1% in the month. But that was a bit weaker than the 4% rise forecast by Edmunds. Chrysler, which fell behind Honda in U.S. sales last month to become the No. 5 U.S. automaker, saw its sales plunge 36% in the month, worse even than the 31% drop forecast by Edmunds. The automaker tried to lure car buyers nervous about gas prices with an incentive that locked in $2.99 a gallon gas for three years. It announced Tuesday it was extending that offer through the end of July, despite the weak June sales. On Monday, Chrysler announced plans to shut its St. Louis assembly line that builds minivans on Oct. 31. It will also cut one of two shifts at an adjoining plant that makes full-size pickups. The two cutbacks will result in the loss of 2,400 hourly jobs. Nissan also saw sales fall more sharply than anticipated. Its sales were off 18%, far worse than the forecast of an 8% decline. One other factor leading to the weak sales in June was fewer sales days and one less weekend compared to the year-earlier period. The Japanese automakers reported smaller percentage declines in sales than the raw numbers indicated because they based their comparisons on a daily sales rate, rather than absolute sales.